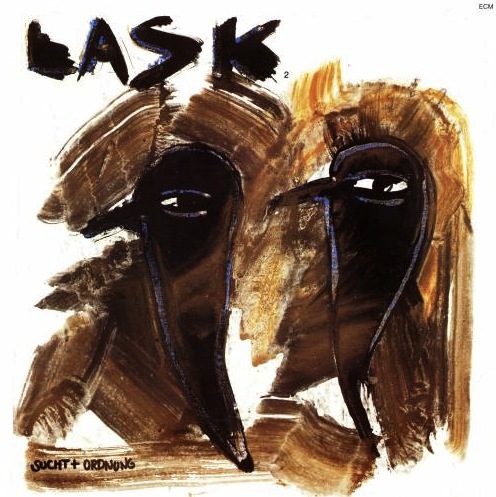 Lask 2 is worth listening to at least once and is yet another example of a recording that breaks the mold into which ECM criticism is so often poured. Like the voice in “Freie Mädchen Arbeiten Im Hafen” that laughs at her own aplomb, this head-scratching detour on the label’s quest for silence spits in its own face, so that any insult you might throw its way will have to contend with a sheen of self-derision. Worth finding if your face prefers to wear a smile. Take a little Mr. Bungle, mix in some Elliot Sharp, add a dash of Claudia Phillips, and you may just get something akin to this strikingly outlandish rarity from 1982. The voice of Maggie Nicols is the solder that holds everything together, while Ulrich Lask’s laser-like sax and labored synth weave an industrial spell at every turn of the set’s assembly line. The bubbly electronics of “Drain Brain” spray-paint the malaise of a post-punk modernity, where duties and obligations engage one another in a rather debilitating tango with the children’s rhyme “Rain, rain, go away.” Our core confrontations are laid out on the dissecting table of the “Tattooed Lady,” whose multiphonic screams burrow into the urban web of ignorance that clothes us in prescription. This brings us to the album’s reigning highlight. “Kidnapped” is a tongue-in-cheek yet visceral autobiographical experiment about woman who is snatched away for the sole purpose of recording “that new-fangled…funny music with a beat” in ECM’s Ludwigsburg studio. Lask manages to keep pace with the boggling skitters and saxophonic squeals of Nicols, who stretches these enchantments well into “Should We, Geanie?” This speculative exercise in authoritarianism looks at social relations through a glass darkly as neither catalysts nor inhibitions, but rather as tattered newspapers stuffed into the human dichotomy, exploitable only through the vocal act. Thus does the stormy narrative of “Unknown Realms” transform maternity into ancestral longing. Here, the landscape is treated like an entity, a plane where inception is breathlessness, breathlessness is signal, and signal is song. Walking hand in hand with the “Poor Child,” we find a klezmer-like essay on worldly power and the lone citizen just trying to make ends meet on a puddle-splashed street corner. But when we pull our pockets out to cartoonish lengths, we find, as prophesied in “Too Much – Not Enough,” that the generative force of all meaning is its very emptiness. Lask might seem like an anomaly in the ECM catalog, when really it stays true to the label’s ever-adventurous spirit. Dementia as the new art, or art as the new dementia? You decide.